Nocardia brasiliensis and Actinomadura madurae. Biological Sciences. Universidad Autónoma Metropolitana, México City, México. 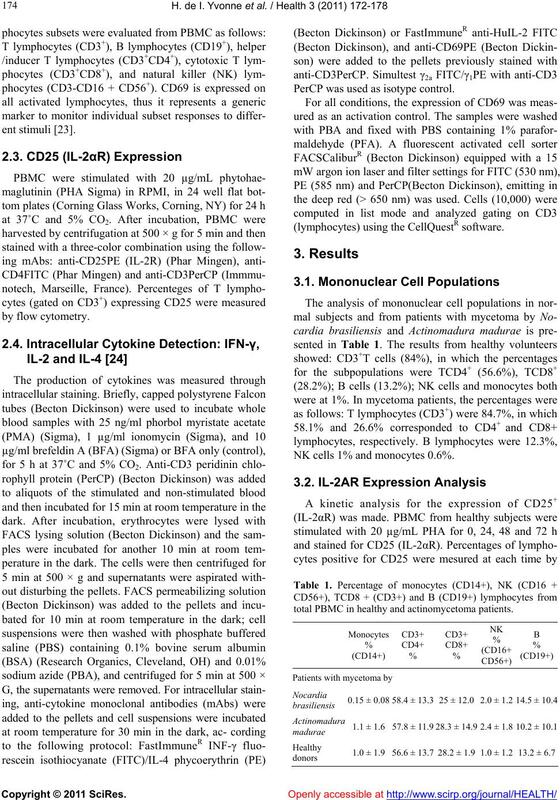 Received 20 January 2011; revised 5 February 2011; accepted 18 February 2011.
natural killer cells (CD16 and CD56) markers. 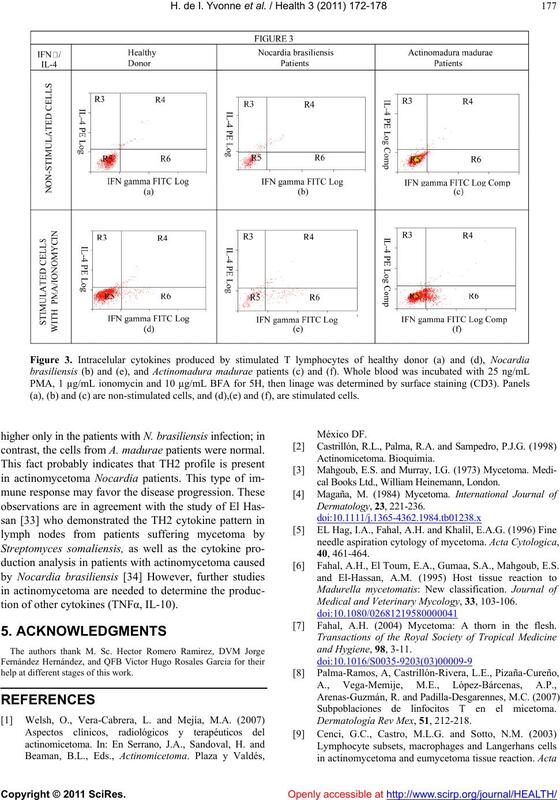 increased only in patients with mycetoma by N.
servation has been reported by other authors. eumycetoma and actinomycetoma respectively [1,2]. infiltrated by neutrophils, causing its fragmentation. main population is TCD4+ . oides did not show these efects . inhibition of phagosome-lysosome fusion . by neutrophil chemotaxis and small vessel congestion. mononuclear cell activation in this pathology. PerCP was used as isotype control. (lymphocytes) using the CellQuestR software. NK cells 1% and monocytes 0.6%. total PBMC in healthy and actinomycetoma patients. madurae respectively were positive for this molecule. nors and actinomycetoma patients, expressing IL-2αR (CD25+). tecting this Th2-type cytokine by flow cytometry . duced IFN-γ and 0.68% produced IL-4. 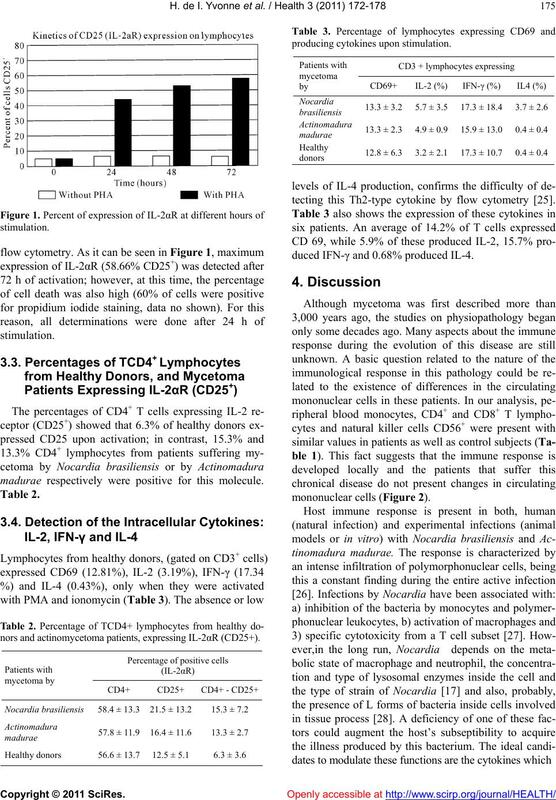 T lymphocytes (gated on CD3+) expressing CD25 were measured by flow cytometry. activation of the immune cellular response. creased with the progression of the disease . portant for B-cell development and antibody production. (a), (b) and (c) are non-stimulated cells, and (d),(e) and (f), are stimulated cells. contrast, the cells from A. madurae patients were normal. tion of other cytokines (TNFα, IL-10). help at different stages of this work. cal Books Ltd., William Heinemann, London. Fahal, A.H., El Toum, E.A., Gumaa, S.A., Mahgoub, E.S. 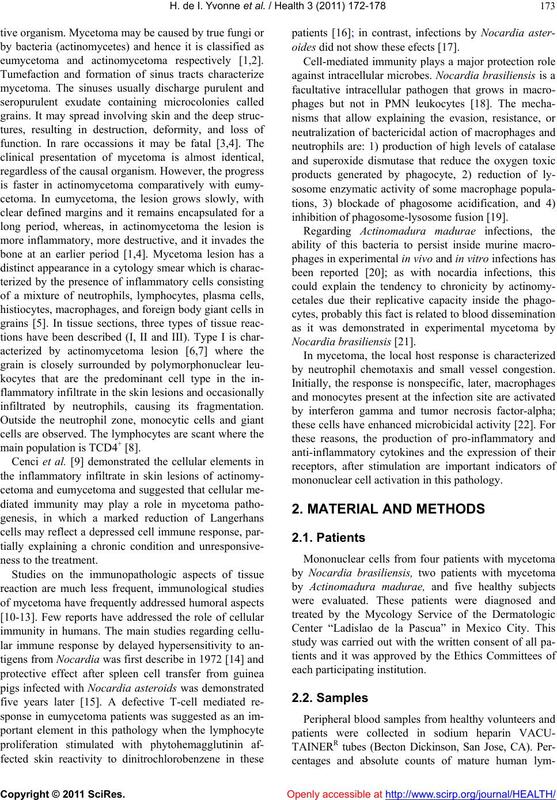 Medical and Veterinary Mycology, 33, 103-106. Fahal, A.H. (2004) Mycetoma: A thorn in the flesh. Subpoblaciones de linfocitos T en el micetoma. Dermatología Rev Mex, 51, 212-218. 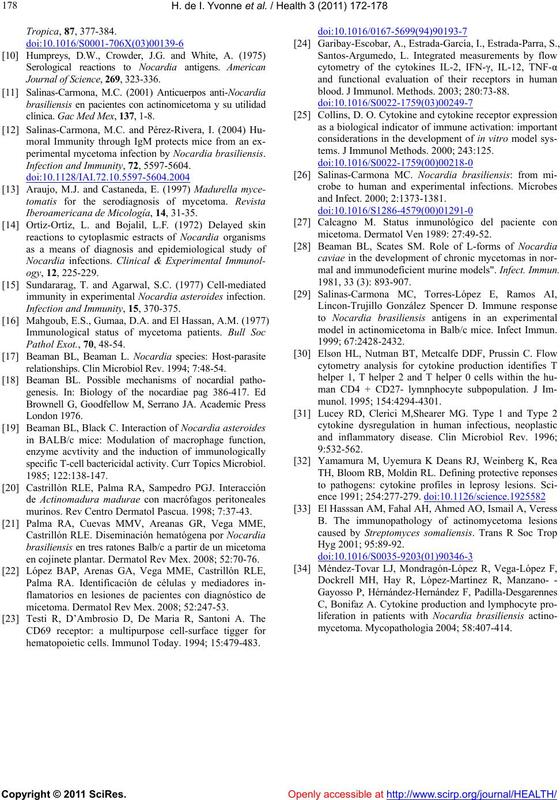 Journal of Science, 269, 323-336.
clínica. Gac Med Mex, 137, 1-8.
perimental mycetoma infection by Nocardia brasiliensis. Infection and Immunity, 72, 5597-5604. 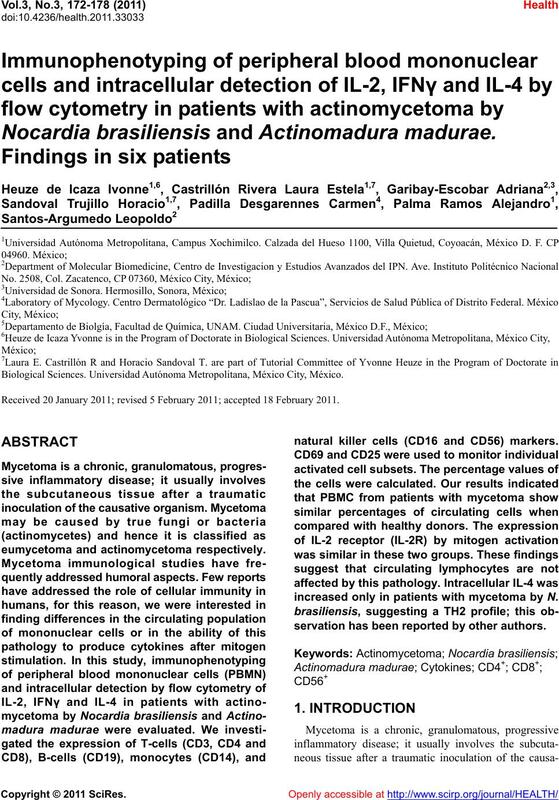 Iberoamericana de Micología, 14, 31-35.
immunity in experimental Nocardia asteroides infection. Infection and Immunity, 15, 370-375.
relationships. Clin Microbiol Rev. 1994; 7:48-54.
specific T-cell bactericidal activity. Curr Topics Microbiol. murinos. Rev Centro Dermatol Pascua. 1998; 7:37-43.
en cojinete plantar. Dermatol Rev Mex. 2008; 52:70-76.
micetoma. Dermatol Rev Mex. 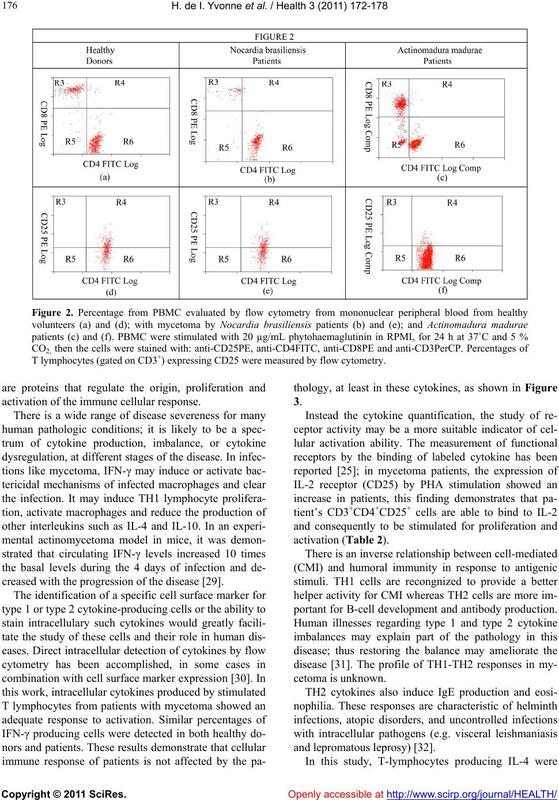 2008; 52:247-53.
hematopoietic cells. Immunol Today. 1994; 15:479-483.
blood. J Immunol. Methods. 2003; 280:73-88.
tems. J Immunol Methods. 2000; 243:125.
micetoma. Dermatol Ven 1989: 27:49-52.
mal and immunodeficient murine models". Infect. Immun. model in actinomicetoma in Balb/c mice. Infect Immun.